Best Chinese Knives: New Ganzo Knives Models: Ganzo G7582 AL G7582AL Aluminum Handle Auto Knife and Ganzo G756 G7563 BM940 Style! New Ganzo Knives Models: Ganzo G7582 AL G7582AL Aluminum Handle Auto Knife and Ganzo G756 G7563 BM940 Style! Ganzo Knives just don't stop! This Chinese manufacturer have put out more models this year than almost any other knife company, and they have no intention to slow down! 2 more models are available now, and man, aren't those long anticipated and special! This knives are only available at DHGate in the present, will probably appear for lower prices soon on Gearbest and Fasttech. 1. Ganzo G7852AL - New automatic knife with safety lock and aluminium handles (at last). Aluminium is one of the best materials to make auto knife handles from, because it can nest the mechanics, while being rugged and light (relatively to steel). The design is heavily influenced by ProTech knives. Comes with a stonewashed blade in 6 colors. 2. Ganzo G756 - Long anticipated model, at least by me. "Inspired" by the fan favorite Benchmade 940 model model, this will make an excellent light EDC knife. 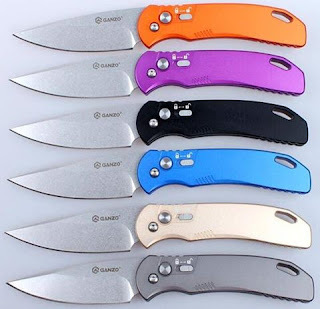 Has the standard Ganzo package - "Axis" lock, anodized thumb studs, screws and handle-blade colors-materials combinations. So what's those green stripes, maybe gitd epoxy? Don't think so, probably just a simple GITD plastic inlays glued in.